With todays extremely cost sensitive market for SATCOM and MILSATCOM, its no wonder more focus and attention is being afforded to small satellites. Weight is the issue  heavy, multifunction satellites require launch vehicles of significant size to deliver them to their assigned orbits, and such is a most expensive proposition. Due to small satellites lower weights and smaller size, the cost to launch them is far less as, usually, multiple small satellites can be simultaneously propelled into orbit. Additionally, the piggy back method can also apply to small satellites, allowing them to ride along in launch vehicles as additional passengers for a large satellite payload. Another factor of significance for smaller satellites is their lower cost for their manufacture. Many times, a variety of smaller satellites can be built using mass production techniques. Small satellites also require a great deal of innovation, especially when it comes to the power driving the spacecraft for attitude control, propulsion, instrument use. Typical sources including butane, carbon dioxide (or a liquid that can be safely vaporized to deliver push), electric power (solar or battery), with any number of new and unique propulsion systems being currently developed by a number of companies. Commercial and military/government interests continue to fuel additional developments, with the latter especially interested in smaller satellites due to their ability to become fully operational in a far shorter period of time than larger satellites, a most important condition for warfighters. Smaller satellites can also be replaced in far shorter time and a full constellation (or a swarm, when applied to nanos and picos) can be deployed with advanced technologies while maintaining cost restrictive budgets. Additionally, smaller satellites, once on orbit, present a unifying capability and can work harmoniously together to produce objectives. Where, previously, ground control stations were needed to order the satellites into various formations, now such can be done automatically with the smaller satellite far more responsive, time-wise, to alter an objectives needs. Among the latest small satellite missions  BeeSat, a pico satellite project of the Technical University of Berlin. The main objective of BeeSat was to prove the viability during on orbit verification of newly developed micro reaction wheels for pico satellite applications. Although there are currently several developers of CUBESATs, many of them lack a precise attitude control system, which is mandatory for more sophisticated applications as pointing capabilities are required. Having a precise attitude control system opens the gate to new potential and cost effective applications  such as Earth observation, space science, astronomy, and on orbit verification of new technologies. Youll readily note the degree of involvement in small satellite development by higher learning institutions, as the lower cost factors allow for universities to engage students and grads in spatial research without incurring enormous research and manufacturing costs. Government organizations are entering into this arena, as is evidenced by an award just made to Orbital Sciences Corporation, that being a Phase 2 contract, from the Defense Advanced Research Projects Agency (DARPA), Arlington, Virginia. Orbital Sciences is to develop the final design for System F6 (Future Fast, Flexible, Fractionated, Free-Flying Spacecraft). The Phase 2 award to Orbital came as a result of a down-select by DARPA from among several companies that participated in the programs Phase 1 study contracts in 2008 and 2009. The Phase 2 contract is valued at US$74.6 million over one-year. The objective of the System F6 program is to develop and demonstrate the basic building blocks of a radically new space architecture in which traditional large, multi-functional monolithic spacecraft are replaced by clusters of wireless interconnected spacecraft modules. Each of these modules performs a subset of the tasks performed by a large classical spacecraft and works together in a cluster to provide the same overall effective mission capability. By allowing the various functions of a spacecraft to be developed and launched separately, this type of fractionated system provides benefits such as reduced overall risk, budgetary and planning flexibility, faster initial deployment, and ultimately greater survivability, including selective replacement of damaged or obsolete elements of a complex spacecraft. In the next phase of the System F6 program, Orbital will be responsible for the detailed design and ground testing of the new technologies, architectures and programmatic concepts required to successfully fractionate a space system. These include wireless data communications, cluster flight operations, distributed spacecraft computing systems, rapidly relocatable ground systems, and value-centric design methodologies. The companys program partners include IBM and NASAs Jet Propulsion Laboratory. Phase 2 will include development of the detailed design of the spacecraft modules, ground elements and launch options; a hardware-in-the-loop test-bed ground demonstration with new technology prototypes; and release of an F6 Developers Kit, which will allow third-parties to design compatible fractionated modules, a new and radical concept in spacecraft systems. All software source code, interfaces, standards and operating systems will be available to everyone, including the public. This will allow any interested third parties to develop modules compatible with the existing spacecraft network. These modules can launch and connect to the already deployed cluster, allowing them to leverage resources available in the network. The eventual goal is to provide an open source compatibility platform where any new satellite launched into space can access and reap the benefits of a worldwide interconnected system, similar in fashion as to how the Internet functions here on Earth. 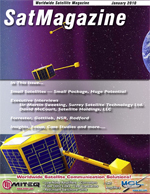 For additional proof as to the interest in small satellites, let�s take a look at NASA. The agency has just partnered with Dynetics and the Von Braun Center for Science and Innovation, or VCSI, and has successfully completed environmental testing of the Fast, Affordable Science and Technology Satellite, or FASTSAT- HSV01. A NASA team built this small, low-cost satellite called FASTSAT, and it�s almost ready to fly. But, why name it FASTSAT? It�s certainly not because it travels fast. It�s because it was built in a hurry. The FASTSAT team built this prototype in a mere 10-� months for the relatively thrifty sum of US$4 million dollars. �That�s unheard of,� says Marshall Space Flight Center�s Edward �Sandy� Montgomery, �to build something that will fly in space in that short time frame and for that amount of money. But that was part of our experiment � to see if it could be done.� The full name says it all: Fast, Affordable, Science and Technology SATellite. FASTSAT-HSV01 is a unique platform that can carry multiple small instruments or experiments to low-Earth orbit on a wide range of expendable launch vehicles for a fraction of the cost traditionally required for such missions. The satellite or �bus� will carry six small payloads, including three technology demonstration experiments and three atmospheric research instruments. FASTSAT is 39.5 inches in diameter � not much larger than the dreaded exercise ball. It is hexagonally shaped and weighs 90 kg without a payload. A payload up to 50 kg can hitch a ride. These dimensions place FASTSAT squarely in the microsatellite category. Recently completed has been the environmental tests that will ensure � before actual flight � the satellite can withstand the rigors of liftoff and the extreme thermal conditions of space. Over the past month, engineers at the Marshall Center subjected the spacecraft to the vibration levels resident with a launch, electromagnetic emissions, and thermal vacuum conditions of space. To be included is Nanosail D, a technology experiment that will demo deployment of a compact solar sail boom system from FASTSAT. Nanosail D was built, and is managed by, the Marshall Center with support from NASA�s Ames Research Center in Moffett Field, California. The other two technology experiments include the Threat Detection System and the Miniature Star Tracker, both managed by the Air Force Research Lab at Kirtland Air Force Base, New Mexico. FASTSAT will be flying a total of six instruments, three of which were developed by Goddard scientists. The Defense Department�s Science and Experiments Review Board approved all six. The Instruments The three Goddard-developed instruments each weigh about 3 kg (6.6 lbs.) and are designed to study different processes in Earth�s upper atmosphere and the effects of solar activity in this region � an important scientific line of inquiry given the fact that intense solar activity can disrupt communications and navigation satellites and exert an aerodynamic drag on low-Earth-orbiting satellites and other space assets. The microsatellite itself is about the size of an exercise ball and was developed to carry Earth-observing and space science missions. And due to its relatively low-cost � at around $10 million, as compared with hundreds of millions for a traditional satellite � the spacecraft is ideal for carrying technology-demonstration payloads. Fortuitous Opportunity The scientists called hitching a ride on the micro-satellite most fortuitous. When they began work on their IRAD-funded instruments three years ago, they thought they would be flying on MidSTAR-2, a follow-on to the successful experimental satellite system developed by students at the U.S. Naval Academy. The Academy did not receive funding to build MidSTAR-2, forcing the trio to seek a different platform on which to integrate their instruments. �The unique confluence of the development of the Goddard instruments, the FASTSAT spacecraft, and the availability of a Defense Department launch opportunity in exchange for experiment results allowed this mission to proceed and become a reality,� said John Sigwarth, the principal investigator on the Thermospheric Temperature Imager. MINI-ME, which weighs less than 3 kg. and is the smallest of the three Goddard-provided FASTSAT payloads, will look for neutral atoms flowing up from Earth�s ionosphere and into the magnetosphere, the magnetic field that surrounds the planet and protects it from the harmful effects of solar wind. In addition to flying on FASTSAT, MINI-ME will fly on a sounding rocket in January 2012 under a US$1.6 million NASA award. Again, it will measure the ion population in Earth�s upper atmosphere. �FASTSAT and the sounding rocket flight are a great start for this instrument concept,� Collier said. PISA will accurately measure electron density and temperature in Earth�s upper atmosphere � data needed to understand the ways that solar wind produce complex structures and turbulence at high altitudes. These structures can scatter radio waves, disrupting communications with low-Earth-orbiting navigation and scientific satellites. The instrument will study what causes the disruptions and whether scientists can predict and monitor them. PISA is a proof-of-concept of a miniaturized instrument that the principal investigator hopes to shrink further to fit inside an even smaller micro-satellite that is expected to fly in 2012. This revolutionary imager will measure in near real-time the global temperature of Earth�s thermosphere, which can heat up and expand during solar storms. Having an instrument that can provide these measurements is crucial for protecting low-altitude satellites. Skylab, for example, plunged to the Earth earlier than expected after a storm-heated atmosphere expanded and exerted an aerodynamic drag on the low-flying laboratory. Thanks to a new class of very low cost launch vehicles (such as SpaceX�s Falcon 1 and Kistler�s K-1), doors have now been opened for inexpensive satellites and instruments. �You wouldn�t put an expensive payload on an inexpensive rocket � it�s a risk issue. You�d use an inexpensive bus to fly an inexpensive instrument on an inexpensive rocket,� says Edward Montgomery. Small satellites � they continue to prove that innovation, combined with manufacturing expediency and cost effectiveness, will continue to grow their use within our industry as viable additions to an already powerful array of products. Our thanks to the following writers and editors who authored the NASA content: Dauna Coulter, Rob Gutro, Kim Newton, Judy Campbell, First Lt. Robert J. Wilcox and Dr. Tony Phillips.